Part baseball card product and part history lesson, 1960 Fleer Baseball Greats is more about the quality of the Hall of Fame names included instead of the actual cards featured. Boasting all-time greats in baseball from Cap Anson to Babe Ruth and Ted Williams, the affordable set covers an extensive period of the national pastime's legacy. 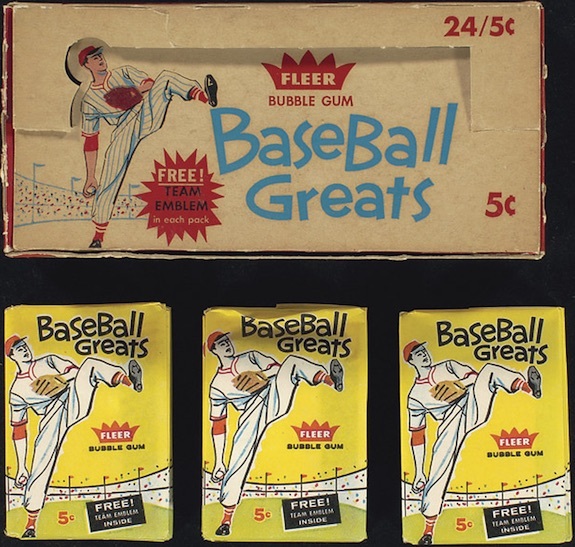 1960 Fleer Baseball is limited by Topps' exclusive rights to use current player photos sold with gum products. To offset this, Fleer issued the Baseball Greats set with retired players. In addition to their ongoing exclusive with Ted Williams, Fleer was also able come to terms with several recently retired stars like Bob Feller and Ralph Kiner. Unfortunately, the card design and choice of player photos failed to impress kids when it debuted. There are a total of 79 base cards in the complete set, not including the #80 variations. Nearly every subject that appears in 1960 Fleer Baseball is now immortalized in Cooperstown. The checklist consists of players, managers, executives and two league commissioners. 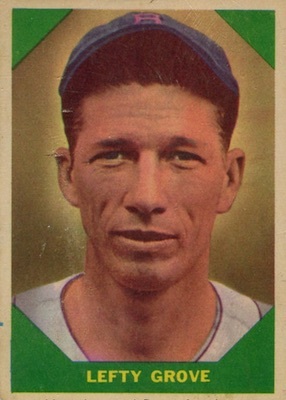 However, some are featured in Old-Timers' or unfamiliar uniforms, and many were well past their playing days in the images that were showcased. 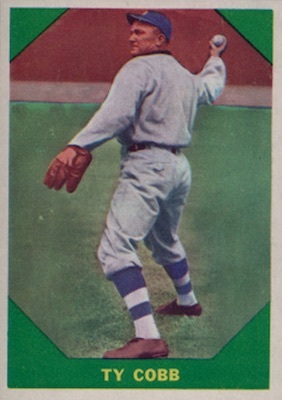 1960 Fleer Baseball card fronts feature a posed photograph of the depicted player, usually a head-and-shoulders shot, although a few cards do utilize action photos. Some are in color, but the majority of the images are colorized black-and-white photos. A solid-colored, octagonal shape frames the picture using either blue, green, red or yellow scheme. 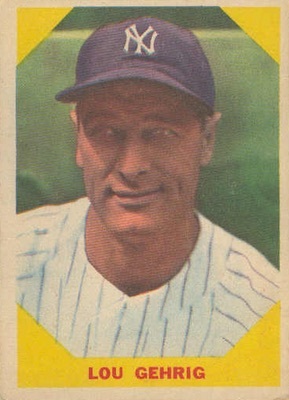 The player's name appears at the bottom of the card. Although primarily laid out in a vertical orientation, a few cards are horizontally arranged. 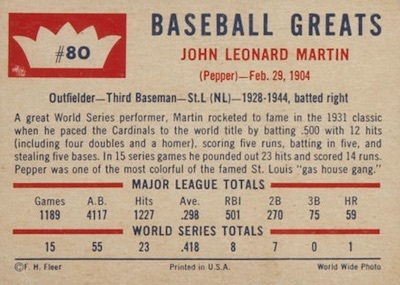 The 1960 Fleer Baseball backs have a short biography and the career batting or pitching statistics for the players. 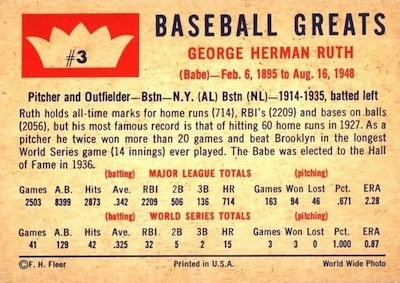 At the top, a crown inside a red box shows the card number, with the words "Baseball Greats" and the person's name, date of birth (and in some cases, his death) to the right. Measuring the now standard 2-1/2" by 3-1/2", the entire set was printed and released in a single series. 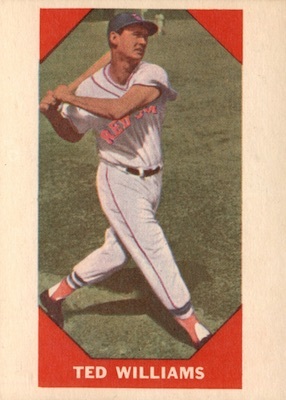 One anomaly to the set is that of Ted Williams' card #72, which was printed with extremely over-sized borders, creating a narrowed card image. 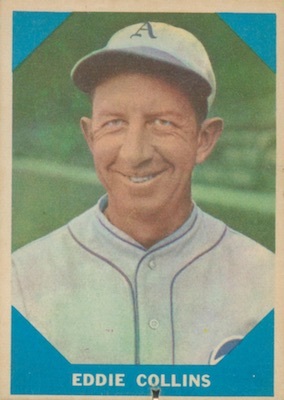 Although 80 cards are listed in the set, there are known variation cards of Joe Tinker, Eddie Collins and Lefty Grove that each have a #80 Pepper Martin back. It's likely that a Martin card was planned but ultimately scrapped because Fleer was unable to get permission to use his image. 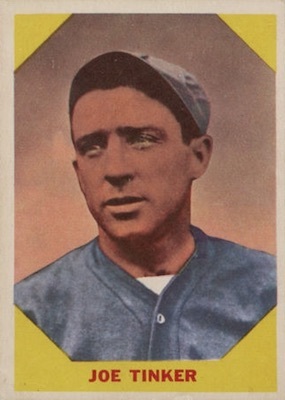 These variations are all limited, but the Joe Tinker version is the most scarce, followed by Eddie Collins and then Lefty Grove. The three variation cards are not considered part of the complete set. It is important to note that the #80 cards are normally found hand-cut or cancelled, but some have reportedly been pulled in packs. Today, the concept of a set made up of great players from the past is fairly common, but it was a new idea in 1960. Unfortunately for Fleer, it wasn't a big hit with kids. 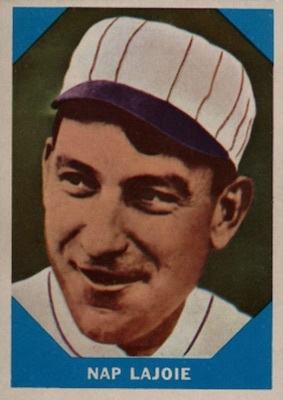 They may have known about Babe Ruth, Ty Cobb and Lou Gehrig, but weren't overly impressed by having images from Old-Timers' Day or executives in suits on their cards. 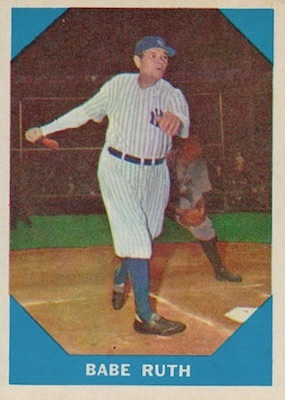 Despite those negatives, 1960 Fleer offers a way for many collectors to add cards of big-name stars to their collection without having to shell out huge amounts of money. This is especially true for the truly iconic players, like Ruth or Cobb, whose contemporary cards fetch enormous prices. A fun and affordable set, 1960 Fleer Baseball Greats, has finally earned the respect that it deserves from vintage collectors. Cards in top grades command respectable sums on the secondary market. Compared to other sets from the era, the 1960 Fleer issue tends to be slightly more scarce as a whole. This is simply because of the lack of popularity the cards garnered at the time of their release. Ted Williams SGC 8 1960 Fleer Perfectly Centered Boston Red Sox Baseball Card! 1960 FLEER MICKEY COCHRANE BECKETT BVG LOOK AT CONDITION?? 82 cards. Shop for base cards on eBay. Card #80 has three versions and all limited. Double prints (DP) are noted below.